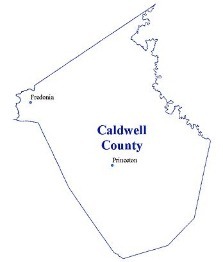 Caldwell County, located in the Pennyrile area of the west central part of the state, was established in 1809, and named after General John Caldwell. A Virginian and Indian fighter, Caldwell served under General George Rogers Clark in his 1786 Indian expedition. He later served as Kentucky's second lieutenant governor. The county seat is located at Princeton in the central part of the county. Caldwell County was formed from an area that previously had been in Livingston County. Lake Beshear, at the edge of the Pennyrile Forest State Park, is on the eastern boundary of the county. Also, in the east central area, is the Jones-Keeney Wildlife Management Area. 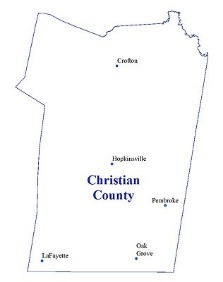 Christian County, one of the earliest of the western Kentucky counties, was formed in 1796 and is located in the Pennyrile area. The county seat is Hopkinsville, a highway hub in the southwestern part of the state. The county's southern border joins Tennessee. In the northwest part of the county, Lake Beshear and the Pennyrile State Resort Park provide recreational opportunities. The county was created from lands previously part of Logan County, and named after a Virginian, Colonel William Christian, a Revolutionary War officer who settled in Kentucky in 1785. Crittenden County, located in the Pennyrile Region of Western Kentucky, was formed in 1842 from a part of Livingston County. Illinois is directly across the Ohio River that forms the county's northwest boundary. Marion is the county seat. 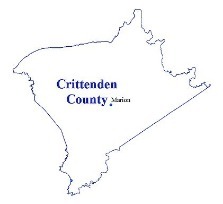 The county is named for John Jordan Crittenden, a native Kentuckian, who spent more than fifty years in public service at the local, state and national levels. At various times, Crittenden was a US Senator, Attorney General of the United States, a state and federal legislator and governor of the state. As governor, Crittenden maintained that "the dissolution of the Union can never be regarded- ought never to be regarded- as a remedy,but as the consummation of thegreatest evil that can befall us." Crittenden returned to Kentucky in 1861 to keep his state from seceding, and died in 1863. 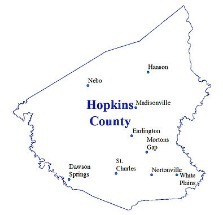 Hopkins County, located in the Pennyrile area of southwestern Kentucky, was formed in 1806 from a part of Henderson County. The county seat is located at Madisonville in the central area of the county. The county is named in honor of General Samuel Hopkins who distinguished himself at the battles of Trenton, Princeton, Monmouth, Brandywine and Germantown. This native Virginian, born in 1753 in Albemarle County, settled in the Green River County of Kentucky in 1797. Hopkins served that area in the state legislature and as a member of the thirteenth Congress. Livingston County, formed in 1798 from a portion of Christian County, is located in the Pennyrile of western Kentucky, bordering Illinois. The county seat is Smithland. 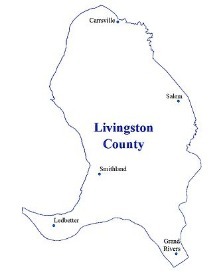 Livingston County was named in honor of Robert Livingston, one of the five men who drew up the Declaration of Independence in 1776. Livingston, born in New York City, was a graduate of Columbia College before attending the Continental Congress. He served as a U.S. secretary of foreign affairs and chancellor of New York State. He obtained a monopoly of steam navigation after aiding Robert Fulton in building his steamboat. 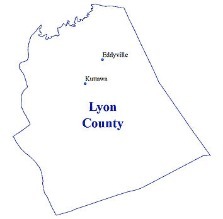 Eddyville is the county seat of Lyon County, which is located in the Pennyrile area of western Kentucky. The county was created in 1854, from a part of Caldwell County. Colonel Matthew Lyon was the first settler to come to what is know know as Lyon County. He was born in Ireland in 1750 and came to America some 15 years later. Lyon not only cast the decisive vote that elected Thomas Jefferson as President of the United States, but earlier, in 1798, he had been prosecuted under the Sedition Act, which he had publicly opposed. Imprisoned and fined, the prosecution produced the natural result at that time - Lyon was re-elected by an overwhelming majority. The prosecution was of doubtful legality and combined with a charge of jury-packing, Lyon’s continuation in office was assured. He eventually became a Kentucky legislator, serving from 1802 until 1811. In 1820 Lyon was appointed by President Monroe as factor to the Cherokee Indian Nation. Contrary to Popular belief, the County was not named for Matthew Lyon, but for his son, Chittenden Lyon, who served four terms as a representative in Congress from 1827-1835. Lake Barkley and the famous Land Between the Lakes are located partially in Lyon County. This rich recreational area is known throughout the county. 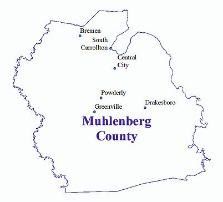 Muhlenberg County, named in honor of General Peter Muhlenberg who fought in the Revolution, was established in 1798 from portions of Logan and Christian counties. Greenville is the County Seat, while Central City is another significant community in the county. The Green River forms much of the eastern border of the county while the Pond River forms the entire western border. Lake Malone State Park is located in the south central part of Muhlenberg County. 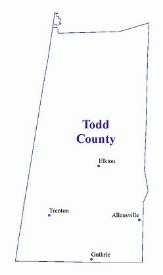 Todd County, named in honor of Colonel John Todd, an Indian fighter who died in the Battle of Blue Licks, was established in 1819 from portions of Logan and Christian counties. Elkton is the county seat. The Jefferson Davis Monument State Historic Site is located in Todd County at Fairview, on the western edge of the county. 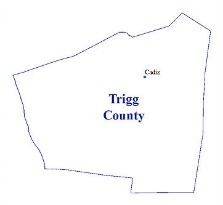 Cadiz is the county seat of Trigg County which is located in the Pennyrile area of southwestern Kentucky. The county, established in 1820 from parts of Christian and Caldwell counties, was named in honor of Colonel Stephen Trigg. He had established Trigg Station on Cave Run near Harrodsburg, and then had died in the Battle of Blue Licks. Tennessee forms the southern border of the county, which contains a portion of the Land Between the Lakes (that area lying between Lake Barkley and Kentucky Lake) as well as part of the Fort Campbell Military Reservation. The famous Lake Barkley State Resort Park is in the north central part of the county. A number of recreational and residential developments near Lake Barkley show the recreational value of this great impoundment of the Cumberland River. Kentucky Lake, a massive impoundment of the Tennessee River, forms the western border of the county.